Stop and smell the roses or tiptoe through the tulips. Coastal Alabama is blooming with floral attractions to enjoy. Spring brings azalea blooms to Bellingrath Gardens and Home. Bellingrath Gardens and Home is a top attraction on the Alabama Gulf Coast. Spend your day perusing 65 acres of plush foliage and flowers and explore an historic estate filled with priceless antiques. Keep your eye peeled while walking through Dauphin Island’s Audubon Bird Sanctuary; you are sure to spot rare species of migrating birds in the spring and winter, as well as beautiful butterflies and flora and fauna. Explore Mobile’s Historic Oakleigh Garden District, where you can enjoy touring many antebellum homes and gardens. Many other decades-old parks and plazas abound, especially around downtown all around the beautiful Bienville Square. 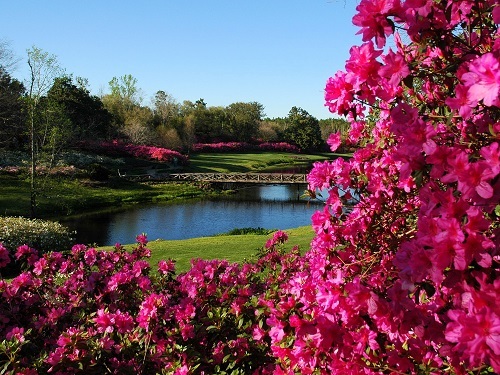 If you’re visiting in the spring, tour Mobile’s Azalea Trail. Mobile’s famous Trail Maids are often found at one of the many homes along the trail. The annual Festival of Flowers continues to enchant, entertain and educate visitors with more than eight acres of exhibits under tent and sky. The Mobile Botanical Gardens offers 100 acres of paved garden areas and woodland gardens and trails. See the largest collection of plants on the Gulf Coast and learn about the diversity of the local plant and wildlife. The Eastern Shore Trail stretches from I-10 at the Overlook down, past a number of beautiful spots, to Weeks Bay. Fairhope’s picturesque Municipal Pier is one of those places taken right from a postcard. The often photographed, oak-lined path and park sits on Mobile Bay and features a rose garden, fountain, pier, beach and walking trails. Village Point Park Preserve is an estuary for wildlife. The park offers nature trails, the massive Jackson’s Oak, a colonial cemetery, beach and pier. Take a tour of some of the most unique places on the Delta by exploring North Baldwin’s Live Oak Landing, Bottle Creek Indian Mounds and four other sites along the Alabama Coastal Birding Trail. Explore the historic Blackburn and Rex Parks in downtown Bay Minette, and visit the old Clock Tower and Kahalley House and Gardens while there. Stroll through the Splinter Hill Bog, home to some of the most spectacular pitcher plant bogs in the world. The Splinter Hill Bog Preserve and the adjacent state-owned Forever Wild Preserve contain some of the most intact seepage bog communities remaining on the Gulf Coast. Numerous rare and declining species associated with seepage bogs, upland longleaf forest and coastal blackwater streams are known to occur within this site. The Island’s Bon Secour National Wildlife Refuge has gorgeous trails that wind you through amazing coastal terrain and are a hot spot for annual birding migration events in spring and winter. Foley’s Graham Creek Nature Preserve offers trails and water-access to some of the most pristine rivers and waterways in Alabama. The Preserve also provides a variety of exercise stopping points near natural gardens, children’s nature class installments and more. Make sure to come in spring and enjoy Foley’s famous Antique Rose Trail. This picturesque walking trail features more than 5,000 fragrant and hardy antique roses, and benches and gazebos are available for resting.